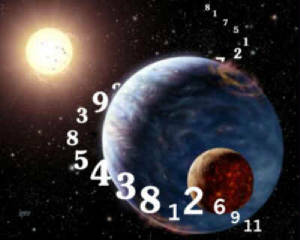 In numerology every number has a corresponding letter associated with it. Each and every number also has it's own distinct set of meanings, emotions, gender, religious and/or astrological significance. The date 12-21-12 reads as, A-B-B-A-A-B. When you consider that the Hebrew language is read from right to left, this date would read BA ABBA. The Hebrew translation for BA ABBA is "Father comes" or "Father is coming"
Another shocking revelation is the scientific timing of the alignment of our sun with the milk way galaxy. At 12/21/12 at 11:11 p.m Universal Time, this alignment will occur. The number '11' is the general number of magic or sorcery and energy tending to change. Uranus. This is the individual in confrontation with the world. It is also the number of war and the battle with the demonic element. The Number '12' is the "Hanged Man". Plunged into the world without being a part of it. Large Sacrifice. The Number '21' is building a better world (apocalypse). Thus at 11:11 UT on 12/21/12, there is a confrontation as the world of reason is plunged into to fight with demonic forces that involves a large sacrifice for the eventual betterment of the earth and all it's living creatures. The 2012 Apocalypse. Life has always had a beginning middle and end and it will always be like that ,but will the year 2012 be the beginning middle and end of humanity we can only wait and see ,there will be no escaping no matter how rich you are death is the only certainty in life and not negotiable ,but its like they say it is how you go and knowing that people are still around its the not knowing that is the problem. IS THIS IT THE SIGN OF THE FORTHCOMMING POLESHIFT AND WILL THE WHOLE WORLD BE NEXT?????? Professor KEVIN P FURLONG, a geoscientist, asks: What's the deal with all these aftershocks? 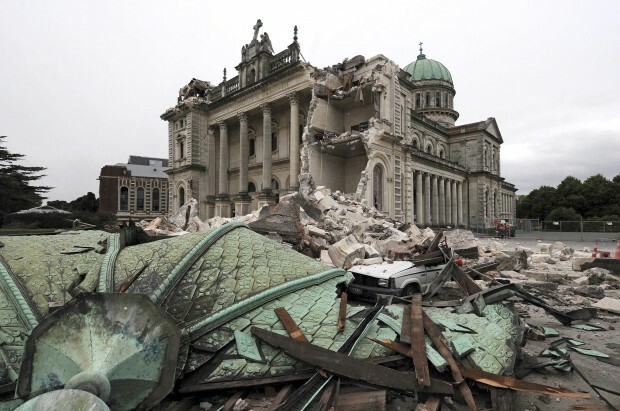 Cantabrians have become experts in detecting the subtle differences among earthquakes. But such expertise does not bring with it much comfort in light of continuing events. Since the September 4 earthquake, we have experienced hundreds of felt earthquakes within a total of thousands of aftershocks following the main event. Throughout this entire episode, the earthquake-science community continues to reassure the public that there is nothing strange or out of the ordinary about the aftershocks. But for many, aftershocks remain a real source of personal concern. Perhaps it is now useful to step back and explain why aftershocks occur, what controls their locations and sizes, and why the current spate of events is not a cause for alarm, but rather a reminder of the value in maintaining vigilance and preparedness. Aftershocks are just earthquakes; they obey the same laws of physics as other earthquakes. We use the term aftershocks to differentiate them, since we consider them to have been caused or encouraged by the initial main- shock earthquake. In other words, if the main shock hadn't occurred we wouldn't be getting the aftershocks. But not all aftershocks are the same. In general there are two main categories of aftershocks - ones that occur on or very near the fault plane of the main earthquake, and others that occur in areas where earthquake-caused crustal stress changes help trigger these small earthquakes. The main magnitude 7.1 earthquake occurred primarily on a nearly-vertical fault plane extending about 10 to 15 kilometres downward into the crust and perhaps as much as 50km along its east-west length. About 30km of this fault length ruptured all of the way to the surface, producing the impressive fault we see extending from west of Greendale to the western outskirts of Rolleston. That 30km-long surface fault is only part of the story, and geophysical evidence suggests that the fault continues in bedrock beyond the ends of the surface rupture. This continuation of the fault at depth is typical of many earthquake ruptures; in fact in the Haiti earthquake there was little or no surface rupture. During our main earthquake, there was slip along the fault that averaged about 2.5 to 3 metres, but the slip during the earthquake was different at different places along the fault, so there were patches along the fault that were not in equilibrium with nearby fault patches. Many of the aftershocks, particularly those occurring during the first few weeks after the main earthquake and that were situated on or near the main fault, result from the processes by which these slip differences are reduced or smoothed. Their occurrence near the mapped fault trace and in regions such as the swath from Rolleston to Lincoln record these fault equilibration processes at work. The size or magnitude of an earthquake is proportional to the product of the fault area multiplied by the distance it slipped. The main magnitude 7.1 earthquake with a fault area of about 500 square km (50km length x 10km depth extent) and an average slip of 2.5m to 3m dwarfs a magnitude 5 aftershock with slip of about 10cm on a fault patch about 3km by 3km, or a magnitude 4 aftershock rupturing a 1 square km patch with slip of only 5cm. Most of the aftershocks this past month record the second category of earthquakes triggered by stress changes. These earthquakes, including the notorious Boxing Day event and the 5.1 on January 20 did not occur on the September 4 fault; rather they are within the crust of the surrounding region where stresses changed enough to cause earthquakes on other small faults. The spatial pattern of these triggered aftershocks is not random. Models of the stress changes caused by the main earthquake can be used to identify where changes are sufficient to either favour or inhibit aftershocks. 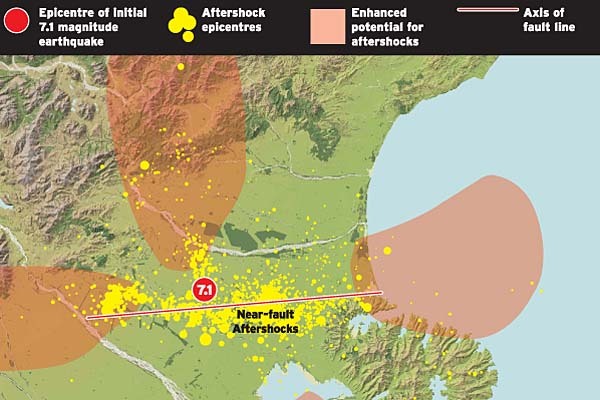 These stress models show that the occurrence of aftershocks in the region of Christchurch city and east of the CBD, north of the main fault trace near Darfield and further north, and west of Horarata are all in places where stress changes favour increased aftershocks. These triggered aftershocks occur on existing structures or zones of weakness in the crust, and are often aligned along linear trends. Maps of Canterbury earthquakes since September 4 show several such trends. In this way the aftershocks help scientists to map the fabric of the crust and identify trends and locations that merit further study. The why, where, and when of aftershocks since the September 4, 2010, earthquake is consistent with the expectations and experiences of earthquake scientists. Most fall neatly into the two likely causes - either adjustments on and near the main fault rupture or small triggered events in regions where stresses increased slightly as a result of the main earthquake. Therefore when a small cluster of events occurs in any particular location, we understand their origin in relation to the stress resulting from the main event and they are unlikely to indicate that another large event on the Greendale Fault is pending. The patterns of these aftershock earthquakes do, however, help to improve our understanding of fault rupture during the main event, and to identify other active structures within the Canterbury crust. Perhaps most importantly, they remind us that preparations and continued vigilance are an important responsibility of living in earthquake country. * Kevin P Furlong is a Visiting Erskine Fellow at the University of Canterbury and Professor of Geosciences at Pennsylvania State University in the United States. Rubble from a damaged building after an earthquake is seen in Christchurch February 22, 2011. A strong earthquake killed and trapped people beneath rubble and sparked fires and toppled buildings in New Zealand's second-biggest city of Christchurch on Tuesday. "It is a just a scene of utter devastation," Prime Minister John Key said after rushing to the city within hours of the quake. He said the death toll was 65, and may rise. "This may be New Zealand's darkest day," he told TV One News. It was the second time a major quake hit the city of 350,000 in five months. Tuesday's 6.3-magnitude temblor struck closer to downtown than a quake that heavily damaged Christchurch last September but caused no deaths when it struck before dawn on a weekend. Video footage Tuesday showed some multistory buildings collapsed in on themselves, and others with walls that had collapsed into the streets, strewn with bricks and shattered concrete. Sidewalks and roads were cracked and split, and thousands of dazed, screaming and crying residents wandered through the streets as sirens blared. Groups of people helped victims clutching bleedings wounds, and others were carried to private vehicles in makeshift stretchers fashioned from rugs or bits of debris. The spire of the iconic stone Christchurch Cathedral toppled into a central city square. Christchurch Mayor Bob Parker declared a state of emergency and ordered people to evacuate the city center. Troops were deployed to help people get out and to throw up a security cordon around the stricken area, said Deputy Prime Minister Bill English. The airport was closed, and Christchurch Hospital was briefly evacuated before it was deemed safe and patients were returned. Power and telephone lines were knocked out, and pipes burst, flooding the streets with water. Some cars parked on the street were buried under rubble. Some people were stuck in office towers and firefighters climbed extension ladders to pluck people trapped on roofs to safety. A crane lifted a team of rescuers on a platform to one group of survivors in a high-rise. Plumes of gray smoke drifted into the air at several points around the city from fires burning in the rubble. Key held an emergency Cabinet meeting then rushed to the stricken city to observe the scene. He said eight or nine buildings had collapsed, and that officials were working as fast as they can to free an unknown number of people who were trapped. New Zealand police said in a statement that reports of fatalities included that two buses had been crushed by falling buildings. Gary Moore said he and 19 other colleagues were trapped in their twelfth floor office after the stairwell collapsed in the quake. He did not know if people on other floors were trapped. "We watched the cathedral collapse out our window while we were holding onto the walls," Moore said. "Every aftershock sends us rushing under the desks. It's very unnerving but we can clearly see there are other priorities out the window. There has been a lot of damage and I guess people are attending to that before they come and get us." The multistory Pyne Gould Guinness Building, housing more than 200 workers, collapsed and an unknown number of people are trapped inside. Television pictures showed rescuers, many of them office workers, dragging severely injured people from the rubble. Many had blood streaming down their faces. Screams could be heard from those still trapped. Parker, the mayor, said he was on the top floor of the city council building when the quake hit just before 1 p.m. local time, throwing him across the room. "I got down onto the street and there were scenes of great confusion, a lot of very upset people," he said. "I know of people in our building who are injured and I've had some reports of serious injuries throughout the city." The U.S. Geological Survey said the temblor was centered 3 miles (5 kilometers) from the city at a depth of 2.5 miles (4 kilometers). Two large aftershocks - one magnitude 5.6 and another 5.5 - hit the city within two hours, and officials warned people to stay away from damaged buildings because of the danger of further collapses. "When the shaking had stopped I looked out of the window, which gives a great view onto Christchurch, and there was just dust," said city councilman Barry Corbett, who was on one of the top floors of the city council building when the quake struck. "It was evident straight away that a lot of buildings had gone." A search and rescue team was being flown in from Australia to help in the recovery, and Australian Prime Minister Julia Gillard said she had offered Key any other support he requested. The USGS said the latest quake was part of the "aftershock sequence" following the 7.1 magnitude earthquake on Sept. 4 last year. That quake wrecked hundreds of buildings, inflicted an estimated 4 billion New Zealand dollars ($3 billion) in damage, but caused no deaths. A strong aftershock in December caused further damage to buildings. The city, considered a tourist center, was still rebuilding from those quakes when Tuesday's temblor hit. The USGS said the latest quake hit "significantly closer to the main population center of Christchurch" than the September quake, which was centered 25 miles (40 kilometers) west of city. "The critical issue with this earthquake was that the epicenter was at shallow depth under Christchurch, so many people were within 10 to 20 kilometers (6 to 12 miles) of the fault rupture," said Gary Gibson, a seismologist at Australia's Melbourne University. Camping lets out a hearty chuckle when he considers the people who believe the world will end in 2012. "That date has not one stitch of biblical authority," Camping says from the Oakland office where he runs Family Radio, an evangelical station that reaches listeners around the world. "It's like a fairy tale." The real date for the end of times, he says, is in 2011. The Mayans and the recent Hollywood movie "2012" have put the apocalypse in the popular mind this year, but Camping has been at this business for a long time. And while Armageddon is pop science or big-screen entertainment to many, Camping has followers from the Bay Area to China. 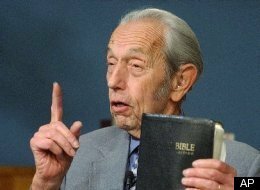 Camping, 88, has scrutinized the Bible for almost 70 years and says he has developed a mathematical system to interpret prophecies hidden within the Good Book. 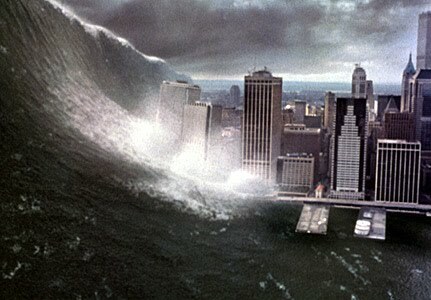 One night a few years ago, Camping, a civil engineer by trade, crunched the numbers and was stunned at what he'd found: The world will end May 21, 2011. This is not the first time Camping has made a bold prediction about Judgment Day. On Sept. 6, 1994, dozens of Camping's believers gathered inside Alameda's Veterans Memorial Building to await the return of Christ, an event Camping had promised for two years. Followers dressed children in their Sunday best and held Bibles open-faced toward heaven. But the world did not end. Camping allowed that he may have made a mathematical error. He spent the next decade running new calculations, as well as overseeing a media company that has grown significantly in size and reach. "We are now translated into 48 languages and have been transmitting into China on an AM station without getting jammed once," Camping said. "How can that happen without God's mercy?" His office is flanked by satellite dishes in the parking lot that transmit his talk show, "Open Forum." In the Bay Area, he's heard on 610 AM, KEAR. Camping says his company owns about 55 stations in the United States alone, and that his message arrives on every continent. Employees at the Oakland office run printing presses that publish Camping's pamphlets and books, and some wear T-shirts that read, "May 21, 2011." They're happy to talk about the day they believe their souls will be retrieved by Christ. "I'm looking forward to it," said Ted Solomon, 60, who started listening to Camping in 1997. He's worked at Family Radio since 2004, making sure international translators properly dictate Camping's sermons. "This world may have had an attraction to me at one time," Solomon said. "But now it's definitely lost its appeal." Camping is a frail-looking man, and his voice is low and deep, but it can rise to dramatic peaks with a preacher's flair. As a young man, he owned an East Bay construction business but longed to work as a servant of God. So he hit the books. "Because I was an engineer, I was very interested in the numbers," he said. "I'd wonder, 'Why did God put this number in, or that number in?' It was not a question of unbelief, it was a question of, 'There must be a reason for it.' "
Camping is not the only man to see truths in the Bible hidden in the numbers. In the late 1990s, a code-breaking phenomenon took off, led by "The Bible Code," written by former Washington Post journalist Michael Drosnin. Drosnin developed a technique that revealed prophecies within the Bible's text. A handful of biblical scholars have supported Drosnin's theory, lending it an air of legitimacy, and just as many scholars have decried it as farce. 2012, the same year some people believe the Mayan calendar marks the end of times, and the same year the "2012" action movie surmised the Earth's crust will destabilize and kill most humans. Cripes, i got a pay rise due then it cant end its taken 3 years of slaving away to get this and now its the end darn it all. There is more to this than meets the eye if scientists are worried then so should we ,The world is overdue a ferocious 'space storm' that could knock out communications satellites, ground aircraft and trigger blackouts - causing hundreds of billions of pounds of damage, scientists say. Astronomers today warned that mankind is now more vulnerable to a major solar storm than at any time in history - and that the planet should prepare for a global Katrina-style disaster. 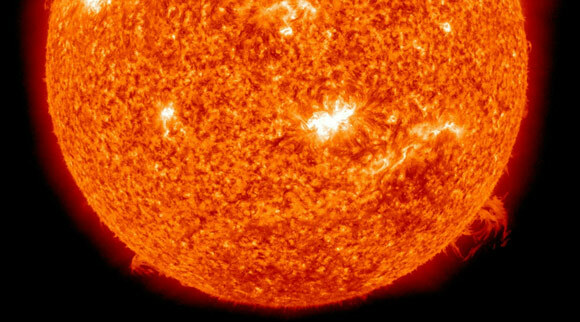 A massive eruption of the sun would save waves of radiation and charged particles to Earth, damaging the satellite systems used for synchronising computers, airline navigation and phone networks.If the storm is powerful enough it could even crash stock markets and cause power cuts that last weeks or months, experts told the American Association for the Advancement of Science. The chances of a disruption from space are getting stronger because the sun is entering the most active period of its 11 to 12-year natural cycle. The storm created spectacular aurorae and disrupted radio communications. Professor Sir John Beddington, the government's chief scientific adviser, said: 'The issue of space weather has got to be taken seriously. We've had a relatively quiet period of space weather - but we can't expect that quiet period to continue. 'At the same time over that period the potential vulnerability of our systems has increased dramatically, whether it is the smart grid in our electricity systems or the ubiquitous use of GPS in just about everything we use these days. 'The situation has changed. We need to be thinking about the ability both to categorise and explain and give early warning when particular types of space weather are likely to occur. 'Solar storms are caused by massive explosions on the sun. The explosions release waves of X-rays and ultraviolet radiation which smash into the Earth within minutes, disrupting radio signals and damaging the electronics of satellites. They are followed ten to 20 minutes later by a burst of energetic particles which cause even more havoc with satellites - and then 15 to 30 hours later by supercharged plasma which collides with Earth's magnetic field. The plasma create the aurora - or Northern Lights - and can induce electrical currents in power lines and cables. Jane Lubchenco, head of the U.S. National Oceanic and Atmospheric Administration, said: 'This is not a matter of if, it is simply a matter of when and how big. 'The last time we had a maximum in the solar cycle, about 10 years ago, the world was a very different place. Cell phones are now ubiquitous; they were certainly around but we didn't rely on them for so many different things. The sun goes through a regular activity cycle about 11 years long on average. The last solar maximum occurred in 2001. Its latest minimum was particularly weak and long lasting. Space storms are not new. The first major solar flare was recorded by British astronomer Richard Carrington in 1859. Other solar geomagnetic storms have been observed in recent decades. One huge solar flare in 1972 cut off long-distance telephone communication in the mid-western state of Illinois, Nasa said. Another similar flare in 1989 'provoked geomagnetic storms that disrupted electric power transmission' and caused blackouts across the Canadian province of Quebec, the U.S. space agency said. The largest solar flare in four years erupted Monday. Its radiation is expected to reach Earth today and Friday and perhaps interfere with communication systems, power grids and navigation satellites. It might also enhance the northern lights.Radiation from the largest solar flare in four years is expected to reach the Earth Thursday and Friday, potentially interfering with communication and navigation satellites and disrupting ground-based communication networks and power grids. The rain of charged particles from the so-called coronal mass ejections, or CMEs, should also enhance the northern lights, also known as the Aurora Borealis, making them both more prominent and visible farther south, perhaps even into the northern tier of the United States, experts said. The solar flare, which erupted Monday, occurs when magnetic field lines on the sun's surface in effect get short-circuited, releasing large amounts of energy into space. Three such events occurred Monday, the largest of them a so-called class X event — the most powerful form of solar flare. Astronomers have been expecting the sun to ramp up its activity after several years of quiescence during its normal 11-year cycle of activity. Maximum solar activity is expected in 2013. Take a look i promise you its an eye opener ,just think we donate to these people who also bug us with phonecalls about donating more yet they have the nerve to pay their cheif exec these amounts most of which are either serving or ex mps ,i think until they have a rethink and pay their executives less than £50k a year people should stop donating .Noone should be earning such gross amounts of money while pleading poverty help us i have to be fair there is people on there earning a normal amount but the very ones which are well known like Barnardos who always plead poverty ,help us ,we have no money ,we are a charity . I can truthfully say that Gordon Lishman who is the cheif exec of age concern has no worries himself about getting old being on £94,000 a year a rise on last years £84,000 ,what did he do that earned himself in times of economic turmoil when they are laying people off a £10k payrise on an already eye watering salary . Either click the title or copy and paste the link . There are volcanoes erupting or starting to erupt all over the world here is just a few with recent activityas in february 2011. It's an exciting time on Kilauea, with high magma pressure forcing lava to the surface in four locations: the Overlook Vent in Halema`uma`u (within 90m of lowest rim, causing intense night-time glow visible from a distance), within Pu`u `O`o crater, from the TEB vent and satellitic ponds, and at the flow-front in Kalapana, where active lava is typically present and legally accessible to our clients. 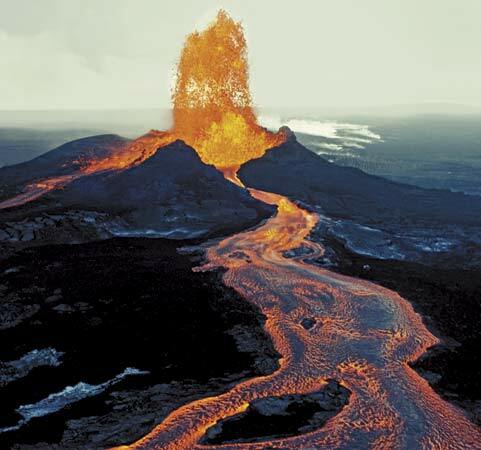 This excess pressure has also caused many earthquakes in the upper east rift zone, the rising of the Halema`uma`u lava lake, and a collapse of the pyroducts carrying lava to the ocean. Mild explosive activity continues at Bromo volcano, with a sustained plume of ash reaching 400-800 m above the crater and incandescent material visible at night, according to local news sources. CVGHM reported about the strong activity on 5 February that volcanic bombs were ejected to up to 1.2-1.4 km distance, and up to 500 m distance in the following days. Roaring and booming noises were noted. Ash fell at the Bromo observation post, and in nearby villages including Ngadirejo (10 km WNW), Sukapura (14 km NE), and Sumber (18 km E). Residents and tourists were not permitted within a 2-km-radius of the active crater. (abbreviated from the Smithsonian/USGS Weekly Volcanic Activity Report 2-8 February 2011). 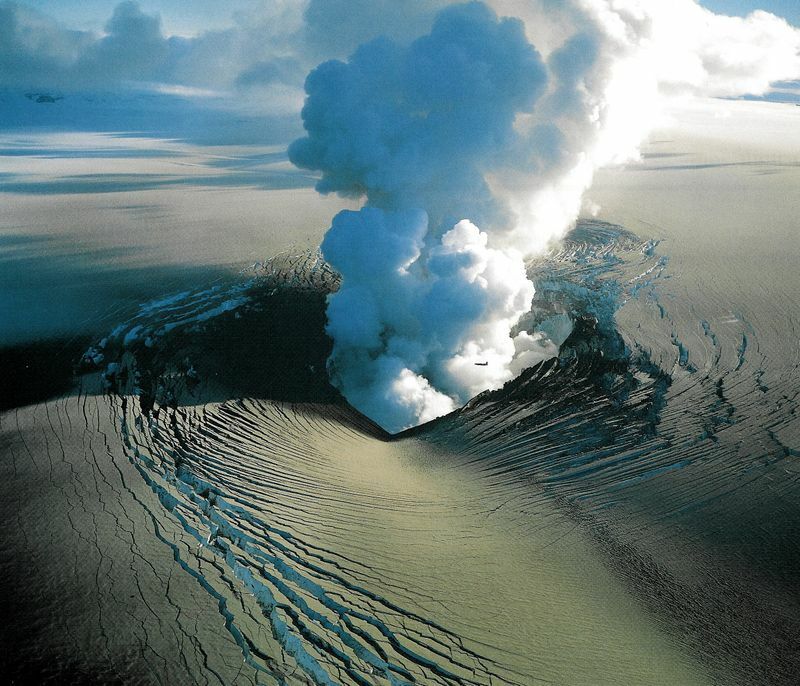 Another Icelandic volcano might be preparing itself for a new eruption. 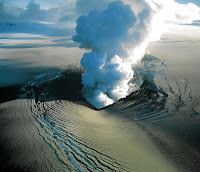 Bárdarbunga, a large central volcano at the NW end of the massive Vatnajökull ice cap, has recently shown increased seismic activity, the Icelandic Met Office is reported in an article of the Telegraph. These could be precursors to new activity. After all, Bárdarbunga is one of Iceland's most active volcanoes and is located quite on the center of the Icelandic hot spot. Its last eruption was in 1902-03. Besides ash clouds, a main hazard would be jökulhlaups (glacier floods) likely to occur with a next eruption of Bárdarbunga. This is getting to biblical preportions and a sure sign of polar reversal or in other words POLESHIFT , there is no records of this phenominal act but the bible did have the floods and noahs arc which was associated with polar reversal. during 2-3 February Fuego produced 27 explosions with ash plumes that rose 300-500 m above the crater and drifted 7 km W and SW. The explosions generated shock waves detected as far away as 5 km W and SW, in Sangre de Cristo, Panimache I and II, and Morelia. Block avalanches descended the Santa Teresa, Taniluyá, Cenizas, and Trinidad drainages to the SW. During 6-8 February explosions produced ash plumes that rose 500 m above the crater and drifted W and SW. At night incandescence was observed emanating from the crater and explosions sometimes ejected incandescent material 100 m above the crater rim. According to a news article, explosions on 2 February from Shinmoe-dake (Shinmoe peak), a stratovolcano of the Kirishima volcano group, disrupted flights to Tokyo. The article also noted that JMA widened the restricted zone to a 4-km-radius around the crater. About 600 people from Miyazaki (55 km E) had evacuated. Based on reports from JMA, analyses of satellite imagery, and pilot observations, the Tokyo VAAC reported that during 2-8 February ash plumes rose to altitudes of 1.5-4.6 km (5,000-15,000 ft) a.s.l. and drifted SE. On 3 February, a pilot noted that an ash plume rose to an altitude of 9.1 km (30,000 ft) a.s.l. and drifted NE. According to JMA, scientists observed Shinmoe-dake during an overflight on 6 February and noted that the lava dome was about 600 m in diameter, similar to observations from four days prior. Gas plumes rose from the edges of the lava dome, from multiple areas on the E side of the dome, and from a central vent. Ash plumes rose 1.5 km above the crater rim and drifted SE. Geologic Summary. Kirishima is a large group of more than 20 Quaternary volcanoes located north of Kagoshima Bay. The late-Pleistocene to Holocene volcano group consists of stratovolcanoes, pyroclastic cones, maars, and underlying shield volcanoes located over an area of 20 x 30 km. The larger stratovolcanoes are scattered throughout the field, with the centrally located, 1,700-m-high Karakuni-dake being the highest. Onami-ike and Mi-ike, the two largest maars, are located SW of Karakuni-dake and at its far eastern end, respectively. Holocene eruptions have been concentrated along an E-W line of vents from Mi-ike to Ohachi, and at Shinmoe-dake to the NE. Frequent small-to-moderate explosive eruptions have been recorded since the 8th century. 2010: International cooperation rules the day. Talks between Washington and Moscow for a follow-on agreement to the Strategic Arms Reduction Treaty are nearly complete, and more negotiations for further reductions in the U.S. and Russian nuclear arsenal are already planned. Additionally, Barack Obama becomes the first U.S. president to publicly call for a nuclear-weapon-free world. The dangers posed by climate change are still great, but there are pockets of progress. Most notably: At Copenhagen, the developing and industrialized countries agree to take responsibility for carbon emissions and to limit global temperature rise to 2 degrees Celsius. 2007: The world stands at the brink of a second nuclear age. The United States and Russia remain ready to stage a nuclear attack within minutes, North Korea conducts a nuclear test, and many in the international community worry that Iran plans to acquire the Bomb. Climate change also presents a dire challenge to humanity. Damage to ecosystems is already taking place; flooding, destructive storms, increased drought, and polar ice melt are causing loss of life and property. 2002: Concerns regarding a nuclear terrorist attack underscore the enormous amount of unsecured--and sometimes unaccounted for--weapon-grade nuclear materials located throughout the world. Meanwhile, the United States expresses a desire to design new nuclear weapons, with an emphasis on those able to destroy hardened and deeply buried targets. It also rejects a series of arms control treaties and announces it will withdraw from the Anti-Ballistic Missile Treaty. 1998: India and Pakistan stage nuclear weapons tests only three weeks apart. "The tests are a symptom of the failure of the international community to fully commit itself to control the spread of nuclear weapons--and to work toward substantial reductions in the numbers of these weapons," a dismayed Bulletin reports. Russia and the United States continue to serve as poor examples to the rest of the world. Together, they still maintain 7,000 warheads ready to fire at each other within 15 minutes. 1995: Hopes for a large post-Cold War peace dividend and a renouncing of nuclear weapons fade. Particularly in the United States, hard-liners seem reluctant to soften their rhetoric or actions, as they claim that a resurgent Russia could provide as much of a threat as the Soviet Union. Such talk slows the rollback in global nuclear forces; more than 40,000 nuclear weapons remain worldwide. There is also concern that terrorists could exploit poorly secured nuclear facilities in the former Soviet Union. 1991: With the Cold War officially over, the United States and Russia begin making deep cuts to their nuclear arsenals. The Strategic Arms Reduction Treaty greatly reduces the number of strategic nuclear weapons deployed by the two former adversaries. Better still, a series of unilateral initiatives remove most of the intercontinental ballistic missiles and bombers in both countries from hair-trigger alert. "The illusion that tens of thousands of nuclear weapons are a guarantor of national security has been stripped away," the Bulletin declares. 1990: As one Eastern European country after another (Poland, Czechoslovakia, Hungary, Romania) frees itself from Soviet control, Soviet General Secretary Mikhail Gorbachev refuses to intervene, halting the ideological battle for Europe and significantly diminishing the risk of all-out nuclear war. In late 1989, the Berlin Wall falls, symbolically ending the Cold War. "Forty-four years after Winston Churchill's 'Iron Curtain' speech, the myth of monolithic communism has been shattered for all to see," the Bulletin proclaims. 1988: The United States and Soviet Union sign the historic Intermediate-Range Nuclear Forces Treaty, the first agreement to actually ban a whole category of nuclear weapons. The leadership shown by President Ronald Reagan and Soviet Premier Mikhail Gorbachev makes the treaty a reality, but public opposition to U.S. nuclear weapons in Western Europe inspires it. For years, such intermediate-range missiles had kept Western Europe in the crosshairs of the two superpowers. 1984: U.S.-Soviet relations reach their iciest point in decades. Dialogue between the two superpowers virtually stops. "Every channel of communications has been constricted or shut down; every form of contact has been attenuated or cut off. And arms control negotiations have been reduced to a species of propaganda," a concerned Bulletin informs readers. The United States seems to flout the few arms control agreements in place by seeking an expansive, space-based anti-ballistic missile capability, raising worries that a new arms race will begin. 1981: The Soviet invasion of Afghanistan hardens the U.S. nuclear posture. Before he leaves office, President Jimmy Carter pulls the United States from the Olympics Games in Moscow and considers ways in which the United States could win a nuclear war. The rhetoric only intensifies with the election of Ronald Reagan as president. Reagan scraps any talk of arms control and proposes that the best way to end the Cold War is for the United States to win it. 1980: Thirty-five years after the start of the nuclear age and after some promising disarmament gains, the United States and the Soviet Union still view nuclear weapons as an integral component of their national security. This stalled progress discourages the Bulletin: "[The Soviet Union and United States have] been behaving like what may best be described as 'nucleoholics'--drunks who continue to insist that the drink being consumed is positively 'the last one,' but who can always find a good excuse for 'just one more round.'" 1974: South Asia gets the Bomb, as India tests its first nuclear device. And any gains in previous arms control agreements seem like a mirage. The United States and Soviet Union appear to be modernizing their nuclear forces, not reducing them. Thanks to the deployment of multiple independently targetable reentry vehicles (MIRV), both countries can now load their intercontinental ballistic missiles with more nuclear warheads than before. 1972: The United States and Soviet Union attempt to curb the race for nuclear superiority by signing the Strategic Arms Limitation Treaty (SALT) and the Anti-Ballistic Missile (ABM) Treaty. The two treaties force a nuclear parity of sorts. SALT limits the number of ballistic missile launchers either country can possess, and the ABM Treaty stops an arms race in defensive weaponry from developing. 1969: Nearly all of the world's nations come together to sign the Nuclear Non-Proliferation Treaty. The deal is simple--the nuclear weapon states vow to help the treaty's non-nuclear weapon signatories develop nuclear power if they promise to forego producing nuclear weapons. The nuclear weapon states also pledge to abolish their own arsenals when political conditions allow for it. Although Israel, India, and Pakistan refuse to sign the treaty, the Bulletin is cautiously optimistic: "The great powers have made the first step. They must proceed without delay to the next one--the dismantling, gradually, of their own oversized military establishments." 1968: Regional wars rage. U.S. involvement in Vietnam intensifies, India and Pakistan battle in 1965, and Israel and its Arab neighbors renew hostilities in 1967. Worse yet, France and China develop nuclear weapons to assert themselves as global players. "There is little reason to feel sanguine about the future of our society on the world scale," the Bulletin laments. "There is a mass revulsion against war, yes; but no sign of conscious intellectual leadership in a rebellion against the deadly heritage of international anarchy." 1963: After a decade of almost non-stop nuclear tests, the United States and Soviet Union sign the Partial Test Ban Treaty, which ends all atmospheric nuclear testing. While it does not outlaw underground testing, the treaty represents progress in at least slowing the arms race. It also signals awareness among the Soviets and United States that they need to work together to prevent nuclear annihilation. 1960: Political actions belie the tough talk of "massive retaliation." For the first time, the United States and Soviet Union appear eager to avoid direct confrontation in regional conflicts such as the 1956 Egyptian-Israeli dispute. Joint projects that build trust and constructive dialogue between third parties also quell diplomatic hostilities. Scientists initiate many of these measures, helping establish the International Geophysical Year, a series of coordinated, worldwide scientific observations, and the Pugwash Conferences, which allow Soviet and American scientists to interact. 1953: After much debate, the United States decides to pursue the hydrogen bomb, a weapon far more powerful than any atomic bomb. In October 1952, the United States tests its first thermonuclear device, obliterating a Pacific Ocean islet in the process; nine months later, the Soviets test an H-bomb of their own. 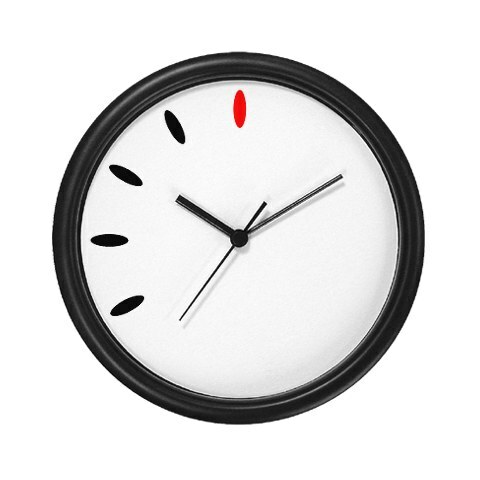 "The hands of the Clock of Doom have moved again," the Bulletin announces. "Only a few more swings of the pendulum, and, from Moscow to Chicago, atomic explosions will strike midnight for Western civilization." 1949: The Soviet Union denies it, but in the fall, President Harry Truman tells the American public that the Soviets tested their first nuclear device, officially starting the arms race. "We do not advise Americans that doomsday is near and that they can expect atomic bombs to start falling on their heads a month or year from now," the Bulletin explains. "But we think they have reason to be deeply alarmed and to be prepared for grave decisions." * I bet you thought over here in the UK you thought you were safe from things that affect the rest of the world didn't you ,after all there isn't ny volcanos over here is there ,think again what a lot of people didn't know is this "there is a supervolcano in scotland".It looks idilic doesnt it the same way as yellowstone does. This is what a professor from the volcanic research committee has to say . 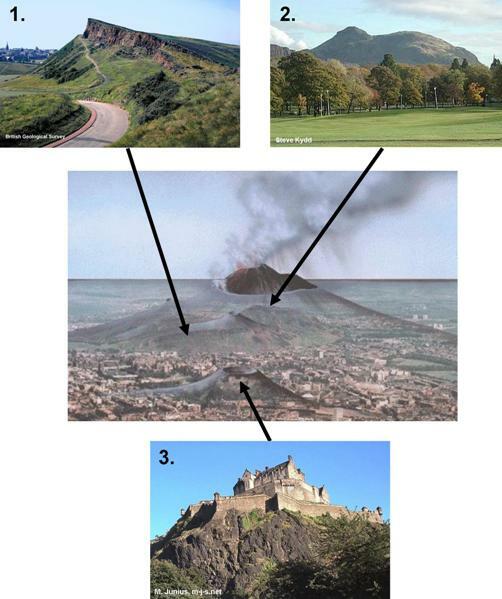 Professor Tom Plume PhD (51) of the EU Volcanic Research Committee has warned that the famous fault-line, known as the Great Glen, may be about to rip apart as a result of a Super Volcano, which has lain dormant for millions of years. Fist sized plankton"Loch Ness lies on the Great Glen fault-line and its incredible depth (over 2km) has severely hampered our research project", said Professor Plume. Unlike some other projects, we need to be able to see right down through the earth's crust, but until recently, we have been restricted to dry land. Fortunately new developments with satellite laser topography sonar side-scanning techniques have enabled us to penetrate through the thick sludge that lies up to 400m thick at the loch's bottom. What we found shocked us: nematode worms and zooplankton the size of a human fist that seem to be feeding on thermal vents." Ironically it was the discovery of the sulphur-feeding creatures that prompted Professor Plume to hire a special robot submarine capable of dropping through a thermal vent and searching beyond. "We found a very active thermal rupture in the sub-base of the loch", said Professor Plume, "further sonar probing showed large lava-filled caverns and pressure readings suggest that a major volcanic event may be about to occur. Tremors have been felt recently in parts of the Highlands of Scotland and it is understood that small seismic shocks often precipitate a major or catastrophic eartchquake or volcanic eruption." For now, however, this fascinating Loch Ness research project continues to probe its bottom. Professor Plume cautiously suggests that Nessie may have managed to survive the ice age by swimming around the warm volcanic vents and feeding on the monster sized sulphur feeding worms and plankton. The volcano may be a relic from the time this area was part of the super-sized continent Pangea. "It's just a theory", he said, "but our research has shown that Loch Ness still holds some incredible mysteries and there is little sign that they will be solved in the near future." How safe do you feel now, do you feel like we have a better chance than the rest of the world everyone knows that so called dormant volcanos have a weird way of comming back to life who can tell what the planet will and can do ,the poleshift means that even tho "sometimes" the lay of the land looks the same its the underneath thousands of miles upon miles benath the surface that matters .But wait read more While ordinary volcanoes can kill thousands of people and destroy entire cities, it's thought a supervolcano could claim up to a billion lives and devastate continents. It's very likely a super-eruption would shutdown airports worldwide. "A super-eruption is the world's biggest bang", says Prof. Bill McGuire of the Benfield Greig Hazard Research Centre at the University of London. "It's a volcanic explosion big enough to dwarf all others and with a reach great enough to affect everyone on the planet". 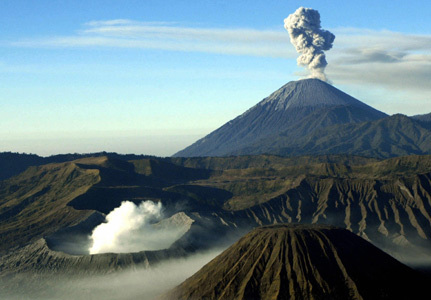 Considering their destructive potential, it's a good thing super-eruptions are so rare – the last one happened in Toba, Indonesia, about 74,000 years ago. Geologists think these eruptions take place about every 50,000 years, which suggests one is overdue. About 40 supervolcanoes are dotted across the globe. There are two in Britain – one in Glencoe, Scotland, the other in Scafell in the Lake District. However, most supervolcanoes, including those in Britain, burned out long ago. Yellowstone, located in the western state, Wyoming, is a dormant supervolcano, which means a major eruption could happen in the future. But before you get worried, it's important to remember that most volcano experts say a Yellowstone super-eruption is probably a long way off, or it may never happen at all. Super size: About 2.1 m years ago the Yellowstone supervolcano erupted 2,500 times more ash than Mount St Helens (pictured). Read about the 1980 Mount St Helens eruption on BBC On This Day. "It's far more likely, if there is an eruption, it'll be on a small scale, perhaps comparable to Mt St Helens," says volcano expert Prof. Steve Sparks of the University of Bristol. Although they're called 'super', most people would have trouble spotting a supervolcano. Their main feature is a large magma chamber, which is an underground reservoir filled with flowing, hot rock under huge pressures. * A super-eruption would equal the force of 1,000 Hiroshima atomic bombs exploding every second. * You could fit Tokyo, the world's biggest city, in Yellowstone national parks super-volcanic crater. ARE YOU SCARED YET AND DON'T FORGET THERE IS 2 x SUPERVOLCANOES IN THE UK!!!!!!!!!!!! 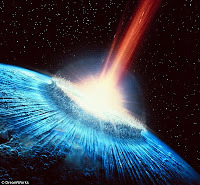 An asteroid travelling at 23,000mph could crash into Earth on April 13, 2036 killing millions and causing global chaos, scientists claim. In a plot line taken straight from a science-fiction film, astronomers in Russia are predicting that the 300-yard-wide Apophis will slam into the planet in 25 years' time. But don't panic just yet, as it is extremely unlikely to happen. So unlikely, in fact, that Nasa has given the catastrophic event odds of 250,000-to-one that it actually takes place. 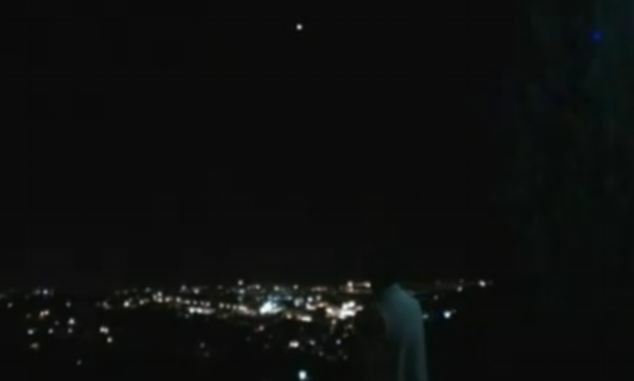 A shining ball of light has been filmed hovering above a Jerusalem shrine, in footage which UFO enthusiasts say could finally prove aliens exist. The clips show the pulsating orb descend and hover above the Dome of the Rock, an ancient Islamic shrine, before shooting up into the night sky. It then descends again and disappears. 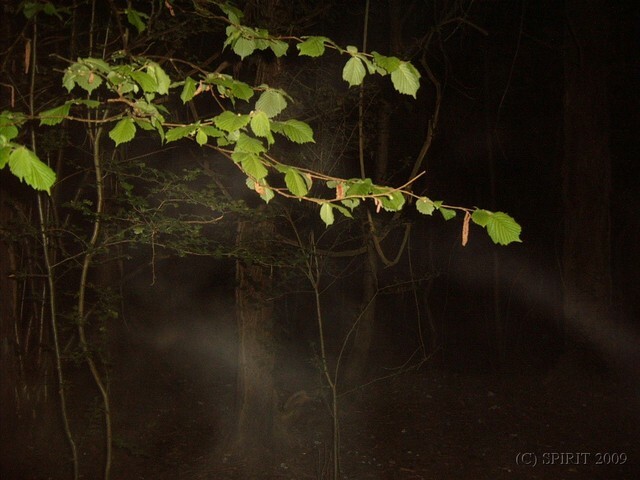 Unusually, the sighting has been filmed from different viewpoints, meaning it has been more difficult to dismiss than most. The footage was taken in Jerusalem at 1am on Saturday morning and has spread like wildfire on the internet. It has been viewed by hundreds of thousands of people and prompted fierce debate among UFO enthusiasts and sceptics. Former Ministry of Defence UFO investigator Nick Pope told The Sun: 'If these are real, they are some of the most incredible videos ever shot. He said the way the object shoots up suggests it is unmanned: 'We know the Israeli army has some very high-tech drones at its disposal. The person who wrote this message to us did so under their own name (which we have checked), and enclosed a number of photographs of them with the Prime Minister of The truth on this i do not know but i do know i covered a similar thing on the Norwegian Seed Vaults both part 1 and 2 ,If and its a Big If it is true it does mean that the plans are done and we will not survive and aren't in the plans to survive ,but there again we already knew that the Elite have special plans with the Governments through out the world to be included in their shelters i hope they can live with their conscience ,of course they could have built numerous shelters throughout the planet in every country but money talks so the only people that will get in are the rich the seed vaults like i already went into a few months back are just a cover for an arc to live in when it gets rough ,i hope it springs a leak. Norway and (separately) with Benazir Bhutto. We are certain of their bona fides, but you will understand that we cannot reveal their real name or publish any photos without consent. I am a Norwegian politician. I would like to say that difficult things will happen from the year 2008 till the year 2012. The Norwegian government is building more and more underground bases and bunkers. When asked, they simply say that it is for the protection of the people of Norway. When I enquire when they are due to be finished, they reply “before 2011”. Israel is also doing the same and many other countries too. My proof that what I am saying is true is in the photographs I have sent of myself and all the Prime Ministers and ministers I tend to meet and am acquainted with. They know all of this, but they don’t want to alarm the people or create mass panic. Planet X is coming, and Norway has begun with storage of food and seeds in the Svalbard area and in the arctic north with the help of the US and EU and all around in Norway. They will only save those that are in the elite of power and those that can build up again: doctors, scientists, and so on. As for me, I already know that I am going to leave before 2012 to go the area of Mosjøen where we have a deep underground military facility. There we are divided into sectors, red, blue and green. The signs of the Norwegian military are already given to them and the camps have already been built a long time ago. The people that are going to be left on the surface and die with along the others will get no help whatsoever. The plan is that 2,000,000 Norwegians are going to be safe, and the rest will die. That means 2,600,000 will perish into the night not knowing what to do. I am very sad. Often I cry with others that know that so many will learn too late, and then it will all be over for them. The government has been lying to the people from 1983 till now. All the major politicians know this in Norway, but few will say it to the people and the public - because they are afraid in case they too will miss the NOAH 12 railcars that will take them to the ark sites where they will be safe. If they tell anyone, they are dead for sure. But I don’t care any more about myself. Mankind must survive and the species must survive. People must know this. All the governments in the world are aware of this and they just say it is going to happen. For those of the people that can save themselves I can only say reach for higher ground and find caves up in the high places where you can have a food storage for at least five years with canned food and water to last for a while. Radiation pills and biosuits are also advisable if your budget allows it. For the last time I say may God help us all... but God will not help us I know. Only each person individually can make a difference. Wake up, please...! I could have written to you using another name but I am not afraid of anything any more. When you know certain things, you become invincible and no harm can come to you when you know that the end is soon. I assure you 100% that things will happen. There are four years to prepare for the endgame. Get weapons, and make survival groups, and a place where you can be safe with food for a time. Ask me anything and I will answer as much as I know about the Norwegian connection to all this. And just look around: they are building underground bases and bunkers everywhere. Open your eyes, people. Ask the governments what they are building, and they will say “Oh, it’s just storage for food”, and so on. They blind you with all the lies. The marks of the alien presence are also there, and I often see the Norwegian elite politicians are not what they say they are. It’s like they are controlled in every thought, and what they have to say is just as they are told to do things in such manners. It is clear for me who they are, and who they are not. You can see it in their eyes and in their minds. Remember that those who are going to be in and around the city areas in 2012 are those that are going to be hit first and die first. Later the army will purge the rest of the survivors and they have a shoot to kill order if there is any resistance to bring them into the camps where every one will get marked with a number and a tag. I also see that Benazir Bhutto is spoken of on your site. Her death was tragic. I have met Benazir, as you can see. You will also see from the photographs that I have met with a number of other notable politicians and world leaders. The public will not know what happens till the very end, because the government does not want to create mass panic. Everything will happen quietly and the government will just disappear. But I say this: don't go quietly into the night. Take precautions to be safe with your family. Come together with others. Work together to find ways to solve all the many problems you will face. I have been to several underground bases [number given]. We used the railcars to get around. Only a few special people were selected to be shown around. Those that run with the elite know of this. I have evidence of my claims. I trust my sources 100%, but they are afraid to tell what they know. People are afraid for their lives and that is how it is. I just also want the public to know what the hell is going on. I am not afraid of death or any other thing. All the elite politicians in Norway know of this. They also know that if they reveal anything they will be removed from office and will be denied access to the different underground bases when the time is up. The NOAH 12 railcars are transport railcars between the different bases underground. They have a support system of these all around from one base to another. They are mainly used by the military and they control all of them. There are orange triangle symbols in each base and the check-ins are a kind of energy field that everyone has to go through. The future for my children is all I think of - and that for all the other children growing up in the new world. We have to make a difference for them so that they grow up knowing what their parents did for them, such as giving this information to people like yourselves. In 2009 the government of FRP will come into power and Siv Jensen will be elected Prime Minister. This is already known. It's important to understand that. The elections are all fake and the same persons and power elite get elected each time in turn. Look up the political history of Norway, and the people that run the country now. Please share this information with the rest of the internet. When the time comes people will survive because of the information they have learned from the different sites on the net. I will not get anything but trouble from posting this, and I have no need to mislead anyone. I do this only to expose what is to happen in my country and that maybe some people will survive what is to come.